The 1,880-mile event is designed to showcase research and development in solar energy and other potential fuel sources for future transport needs. 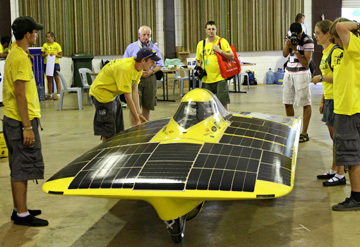 General Motors Corp. is supporting four entrants in the World Solar Challenge race through the Australian Outback. The 1,880-mile (3,020-km) event, which takes place Oct. 21-28 and traverses central Australia from Darwin to Adelaide, is designed to showcase research and development in solar energy and other potential fuel sources for future transport needs. GM has been involved as a sponsor since its Sunraycer solar-powered car won the inaugural event in 1987. In the WSC’s Elite Challenge class, the auto maker is a sponsor of the University of Michigan’s Continuum solar-powered car. This is the ninth-generation entrant from the U of M, which has achieved three third-place finishes in the race. Staff at GM’s Technical Center in Michigan assisted with design and engineering solutions in the production of the vehicle molds, while GM Holden Ltd. aerodynamic engineers helped the team undertake wind-tunnel testing when the vehicle arrived in Australia. GM Holden is providing assistance to two local entrants: Annesley College’s hybrid- electric vehicle in the Greenfleet Prototype class and the Technical and Further Education Institute South Australia’s (TAFE SA) solar-powered car in the Adventure class. For the all-female team at Annesley College, the auto maker provided a Holden Viva hatchback. GM Holden also supplied fuel-efficient Holden Rodeo and Captiva diesel models as support vehicles for TAFE SA’s entrant, the RAA Kelly. In the Greenfleet Technology class, Australia’s first ethanol-production car, the Saab BioPower, will be driven by Team Ethanol on E85 fuel, a blend of 85% gasoline and 15% ethanol. The BioPower is a flex-fuel version of the Saab 9-5 vehicle and is capable of running on gasoline where ethanol isn’t available, as is the case in Australia. GM Holden Director of Innovation Engineering Richard Marshall says the auto maker is committed to energy diversity and finding alternate propulsion breakthroughs. “Looking ahead, we think drivers will begin to understand and choose the alternative powertrain solution that suits their transport needs,” he says. “Where drivers spend most of their time in heavily congested traffic, hybrids may offer the appropriate level of performance with low fuel consumption. “For people whose driving habits typically include a mix of inner city, suburban and country driving, diesel vehicles may be more likely to deliver powerful performance and better fuel economy,” he says, adding diesels are particularly well-suited to Australia, with its low-density residential suburbs, rapidly spreading coastal fringes and long distances between rural population centers. Nine of the 40 vehicles participating in the WSC will use a highly efficient electric motor designed by Australia’s Commonwealth Scientific and Industrial Research Organization – up from just three vehicles in the last event held in 2005. The motor, which sits inside the vehicle’s wheel, was designed about 10 years ago for the Aurora 101 solar-powered car, which won the WSC in 1999 and placed second in 2001. The vehicle is racing again this year. CSIRO says its motor is the most efficient in solar racing, converting 98% of its electricity generated from sunlight into useful power. It also is extremely light: The whole wheel – including the tire and motor – weighs just 32 lbs. (15 kg). Other in-wheel motors used in solar racing typically have energy efficiencies of less than 95%. Also participating in the WSC after its debut at the recent Australian International Motor Show is the Audi A3 Sportback 1.9 TDI e.